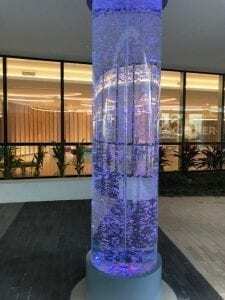 Perfect for the entryway or lobby of your facility, or even at the heart of it, bubble tubes and bubble columns from Midwest Tropical provide a unique piece of art to your space. These water features have a cylindrical design that combines water, light and bubbles into an ever-changing display that will add interest to your space while bringing the calming effects of a water feature. Perfect for any space where you want to create a focal point, indoor bubble water features, including tubes and columns, from Midwest Tropical will exceed your expectations.Consider adding visual interest and value to your location with a custom bubble tube from our team! What makes a bubble tube distinct is its design: It floats, moving bubbles through a vertical column shaped like a tube. Its bubbles are constantly moving and dancing inside the column, creating a visual stimulation that is both soothing and invigorating. Illuminated by LED lights, the resulting display dazzles and delights anyone who sees it. At Midwest Tropical, bubble tubes are available in customizable styles and designs. 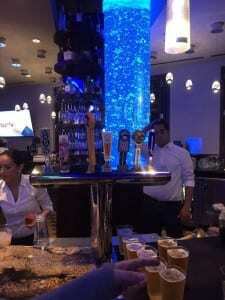 When you partner with Midwest Tropical to create and install your bubble column, your imagination is your only limitation. Our talented team of craftsmen and designers – all of whom work in-house to design and build your water feature – have created bubble tubes as wide as 8 feet in diameter and up to 20 feet tall. We use water, light and enclosed elements to create dazzling displays that captivate and inspire, turning your water feature into the focal point of your facility. We can design and build a custom water bubble tube for any budget and environment, so you can have something that fits your needs perfectly. What makes our bubble tubes and bubble columns even more appealing is the additional included feature. All designs have interchangeable colored filters or customizable changing LED lighting at the top and the bottom, so you can adjust the look whenever you need. Illuminate the endless stream of bubbles with internal lighting that’s the perfect color for the season, and have something new for your customers and clients every time they visit. Tranquility. Bring the appeal of water fountains indoors to your office environment or retail space with a custom bubble tube. This soothing water feature helps make visitors feel more settled and at peace in your setting. Aesthetic appeal. The colors and movement of a bubble column make it a beautiful addition to any environment. Add one to create a visual focal point in your space! Sensory stimulation. While soothing, bubble tubes are also stimulating in the sense of sensory development. They’ve been shown to improve visual tracking skills, auditory awareness and even social interaction. Customizability. At Midwest Tropical, our bubble tubes are made to order, customized to each client’s specifications. Talk to us about creating the kind of bubble tube that’s just right for your facility! Maintenance-free. Midwest Tropical has invented a proprietary sealed and enclosed bubble column tube design that allows no evaporation and requires no regular maintenance. This sealed and enclosed bubble tube is ideal for those looking for a low-maintenance water feature. 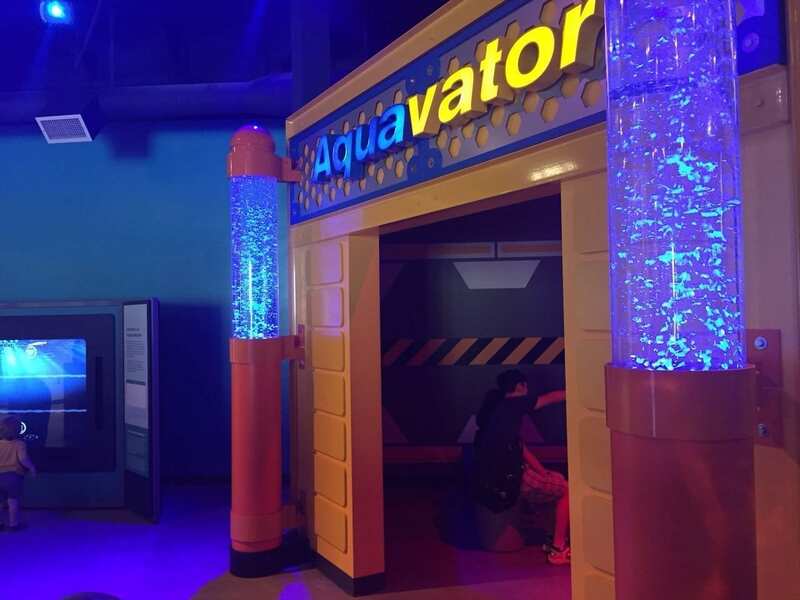 If you want water tubes and bubble columns to dress up your space, there are many companies you can consider, but only Midwest Tropical can claim to have pioneered the idea of enclosed, maintenance-free water features that utilize a special closed loop pump system to stop water evaporation. After seeing how our clients wanted to enjoy the wonders of a fish tank in their medical facilities and other locations (yet did not relish the idea of adding another maintenance task to their plates), we decided to come up with an alternative. That’s how enclosed water features were born. Here’s what you can count on with us: When Midwest Tropical designs bubble tubes for our clients, we handle the entire process in-house. We have designers and craftsman who will work on your project from start to finish, and our turnkey installation is available throughout the United States. Could your hotel, restaurant, shopping center, spa, casino, office, medical facility, hospital or even your home benefit from a low-maintenance, attractive water feature? 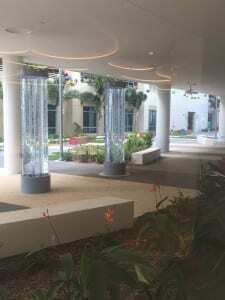 Contact Midwest Tropical for a free quote on your own custom-designed bubble column fountain today.